Patricia became aware of symptoms of what she termed the “Shaking Palsy” during 1993 with changes to her handwriting. Looking back over previous years she had noticed that her writing, though fluent, had been getting smaller, and she had kept trying out new pens. She self-diagnosed (as Parkinson’s Disease) in about September 1994 and this was confirmed by a neurologist in November of that year. She thought I was unaware of her suspicions, but I had been observing her shuffling gait for some time, often suggesting she “pick her feet up”! By this time, the similarities to her father were striking. Her father had been diagnosed with Parkinson’s Disease (PD) but died about a year later from a heart attack. Patricia decided not to start medication straight away. When she did start medication, she started on small dosages of Levadopa-Carbidopa (Sinemet) in about March 1996. This was mainly to please me as she felt that I was distressed by the signs of increasing Parkinsonism, but also because she was finding the rigidity annoying. In mid-1996 Patricia’s neurologist said that he was unhappy with her sluggish chin reflex as he was with her other reflexes, which, he said, were too “sharp”. An MRI scan of the upper spine showed only normal degeneration. Later in the year her neurologist expressed doubts that her illness was true PD, and might be one of a number of similar conditions that had the same symptoms. She had another MRI scan, this time of the brain, and was also referred to another neurologist for a second opinion. The MRI revealed only “changes consistent with PD and not something worse”. The second neurologist endorsed the original diagnosis and suggested she add Bromocriptine (Parlodel) to the Levadopa-Carbidopa.All this time her condition had continued to deteriorate. She was “freezing” and in 1996 began to stammer. She was referred to a Movement Disorders Clinic for outpatient physiotherapy, occupational and speech therapy. By then she was using a walking stick. 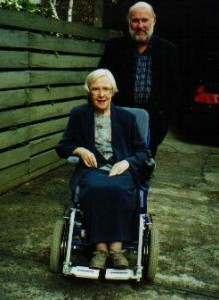 She had another consultation with the second neurologist in June 1997. In his report he at one point made the remark “whether Idiopathic PD or MSA”. He said the treatment for various types of Parkinsonism was the same. Click here (http://www NULL.surfcoastwombat NULL.com/patricia/early-stages/)to go to the next page.